Sorian (front, left) and her team of Curtin Malaysia librarians join the staff and student librarians of SM Sains Miri in a group photo. MIRI: Staff members of Curtin University Malaysia (Curtin Malaysia)’s Library and Learning Commons Section recently provided some assistance to the librarians of Sekolah Menengah (SM) Sains Miri’s Resource Centre. The ‘Cataloguing and Classification Workshop’ was run by Curtin Malaysia to help enhance the school’s library services. The participants comprised two staff members of the resource centre, and 40 student librarians. The Curtin Malaysia’s Library and Learning Commons Section staff members who facilitated the workshop were senior librarian Sorina Ramli and the technical services team comprising Diana Sengalang, Nurul Huda Ibrahim, Nora Tusan and Marina Samsudin. The workshop, among other things, introduced to the school librarians the ‘Dewey Decimal Classification (DDC)’ – an internationally-applied decimal system of library classification that uses a three-figure code to represent the major branches of knowledge, and allows finer classification to be made by the addition of further figures after a decimal point. The participants were also exposed to the use of Library of Congress Subject Headings (LCSH), developed and maintained by the US Library of Congress. It is a controlled vocabulary used for indexing, cataloguing and searching for bibliographic records in library catalogues and electronic databases. This system has been adopted and is being used by modern libraries across the world. According to Sorina, the staff and student librarians should now be able to systematically catalogue and label books according to the DDC standards and subject headings, as well as share constructive ideas and solve problems encountered when doing cataloguing and classification. In thanking SM Sains principal Dzulbadzli Abdullah and Resource Centre teacher Fiona Shu Chew for giving them the opportunity to conduct the workshop, Sorina said her team would continue to share knowledge and collaborating with SM Sains Resource Centre, as it has been doing with public libraries and those of several other schools here. This workshop, which was carried out as part of the Curtin Malaysia’s Library and Learning Commons Section’s community outreach programme, came after it conducted Information Literacy Skills (ILS) workshops for staff and students of SMK Pujut, and SM Vokasional Miri. Curtin Malaysia has one of the most modern and innovative libraries among universities in Malaysia. Its Library and Learning Commons Section serves over 4,000 students and its extensive facilities include ‘The Library’, which occupies approximately 16,100 square feet on three floors, and is complemented by two common study areas across the campus. The Library’s current collections consist of approximately 32,800 printed books, 4,300 audio-visual items, 500 print journals, 420,000 electronic books, 160,000 electronic journals and 600 online databases. For more information about Curtin Malaysia, visit www.curtin.edu.my, its Facebook page (CurtinMalaysia), Twitter profile (curtinmalaysia), Google+ page (Curtin Malaysia), Instagram (curtinmalaysia), YouTube channel (Curtin Malaysia) or LinkedIn page (Curtin Malaysia). 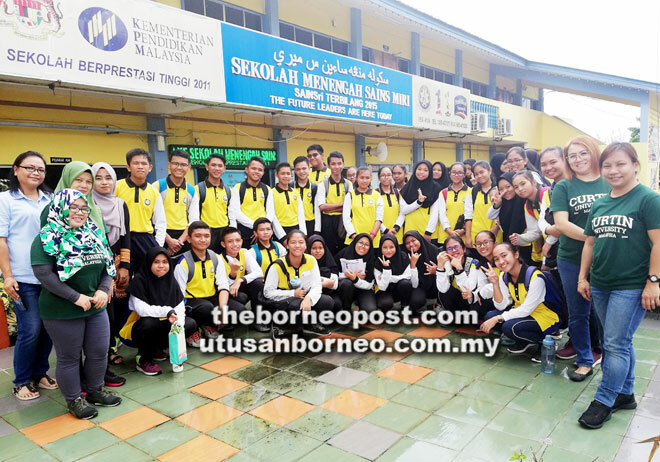 The post Curtin M’sia enhances school’s library services appeared first on Borneo Post Online.